For over 100 years, railway lines with several different track gauges have been running on Germany’s largest island, Rügen: a true natural paradise. The Rügensche Kleinbahn railway made a great contribution to the economic advance in the newly developed Baltic Sea spas around 1900. The Kleinbahn even commissioned a ferry to provide service to the Breetzer Bodden. The Rügensche BäderBahn railway, nicknamed “Rasender Roland” (“Rushing Roland”) is what has remained of the former narrow gauge dream. This railway, operated by the Eisenbahn-Bau- und Betriebsgesellschaft Pressnitztalbahn mbH (PRESS) company, will hopefully continue running for many more years across south-east Rügen as a means of transport for both tourists and locals. A journey on the BäderBahn from Putbus to Göhren is great pleasure for nearly any railway enthusiast as well as for families visiting the island. During your trip through the impressive countryside of the island, you can take a break from the Baltic Sea as it will not be visible through the train window. Rügen is a really large island with great natural beauty. On your train trip you will see the Granitz hills covered by soughing forests, untouched landscape near Seelvitz, stork eyries in Posewald and ancient alleys. The journey will end either in a Baltic Sea spa or in a historic residence of a prince. You can get off the train along the route and take your bike with you – it will be stowed right behind the locomotive. Many passengers appreciate this service, which is not offered by every railway. 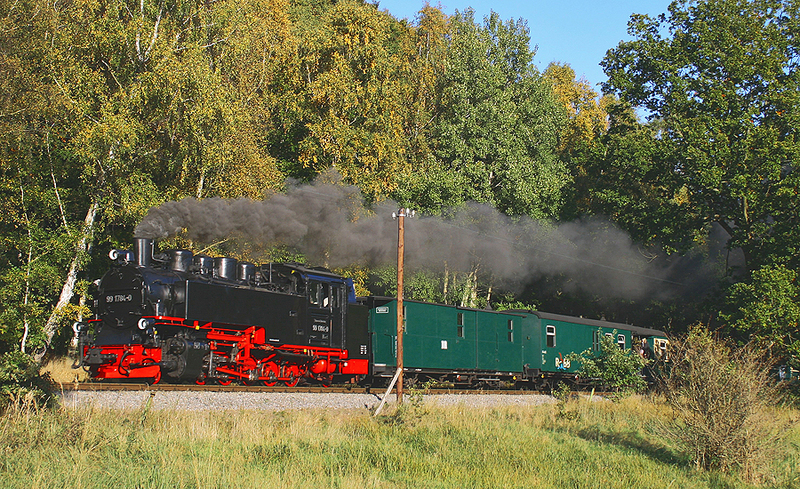 The Rügensche BäderBahn, operated by the PRESS company, has developed to a transport company that plays an important role in the overall concept of tourism on the island of Rügen. The operators of the narrow gauge railway have recognized the potentials of such a railway not only as a means of transport from one place to another, but also as a tourist attraction. The narrow gauge railway route with its vehicles and systems is a unique and wonderful way for visitors to the island to experience hands-on technology. In Germany, and indeed in all of Europe, only narrow gauge railways running in holiday resorts offer daily steam operation according to schedule nowadays. The Rügensche BäderBahn railway scores really high in this Europe-wide competition for impressions and spell. The ever-rising passenger numbers are the best proof of this success – with several factors that are significant for the attraction of the BäderBahn. One of them is related to the unique natural landscapes along the route. Granitz, the south-east Rügen biosphere reserve, and moraine landscapes are as diversified as the German low mountain ranges. Traveling coast to coast by train – where else can you do this in Europe? There are simply too many reasons for buying one or more tickets for the “Rasender Roland” train to list them here. The Rügensche BäderBahn has a heart for its passengers, which is also reflected by its new logo. Welcome on its trains – every year and in every season. In Göhren or Putbus you can even get within touching distance with a steam locomotive when watching the staff restoring the engine. Die Rügensche BäderBahn fährt auf der größten deutschen Insel Rügen. Die Bahnstrecke führt Lauterbach Mole über die ehemaligen Fürstenresidenz Putbus über die Ostseebäder Binz, Sellin, Baabe bis nach Göhren. Zu erreichen ist die Rügensche BäderBahn mit dem Fernverkehr der DB aus vielen Teilen Deutschlands. Sie bietet bequeme umsteigefreie Verbindungen von den Ballungsräumen Rhein/Ruhr, Rhein/Main, Berlin, Hamburg sowie aus Mittel- und Süddeutschland nach Stralsund, bis Bergen auf Rügen und in das Ostseebad Binz an. Die Rügensche BäderBahn fährt täglich mit Dampfzügen. Der Tarif wird nach Zonen fällig.